Paint Creek Public Information Officer Branden Jackman, right, takes a selfie with a crowd of Haitian children recently. Jackman said most Haitian households do not have mirrors, so when someone has a phone with a front-facing camera, children flock to it to see what their faces look like. Emergency responders with the Paint Creek Joint EMS/Fire District often find themselves using their skills and training in unusual situations, but a recent Christian missions trip organized by a local church threw two district personnel into the poorest country in the western hemisphere to provide medical care and other aid to crowds of locals. 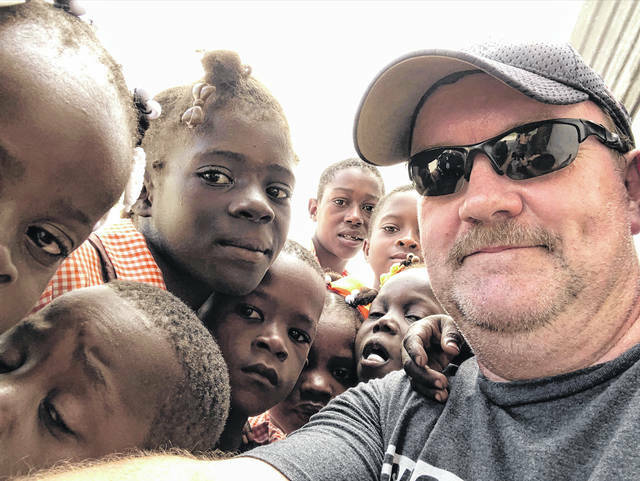 Branden Jackman, Paint Creek’s public information officer, and Spencer Boone, a district firefighter and EMT, spent seven days in Haiti as part of an international outreach organized by Good News Gathering, a Hillsboro church. The trip took volunteers to La Croix New Testament Mission in La Croix, Haiti, where teams of volunteers from GNG provided medical treatment and construction labor at a school. Haiti shares the Caribbean island of Hispaniola with the Dominican Republic, according to the Washington Post. Jackman said he and Boone did not visit Haiti in their professional capacity with Paint Creek, but their training allows them to conduct the same level of medical care in Haiti as they do here. Jackman, who went on the same trip last year, said he worked with several other medical professionals from GNG to treat roughly 500 people in five days at different locations around the island. According to Jackman, the majority of medical problems the team encountered were nutrition-related, with dehydration, high blood pressure and digestive problems among the most common. Boone, who has now been to Haiti three times with GNG, spent most of his time working with the construction team roofing a schoolhouse. He said one of the patients he treated had the highest blood pressure reading he had ever seen: 220 over 120. Jackman said the medical team had to work with translators to overcome the language barrier, since most locals speak Haitian Creole. According to Jackman, volunteers learned the words for “burn” and “pain” to differentiate between stomach ailments. Jackman said GNG volunteers provided health education and gave out toothbrushes and toothpaste, soap and laundry detergent. He said they also prayed with each patient and evangelized to several. Medical care, like clean water and food, is scarce in Haiti, Jackman said. “It’s not like driving 60 miles to Columbus where there’s a Level I trauma center,” he said. According to the Central Intelligence Agency, Haiti is the poorest country in the Western Hemisphere. Close to 60 percent of its population lives under the national poverty line. A magnitude 7.0 earthquake struck Haiti in 2010, devastating much of the island nation and displacing an estimated 1.5 million people, according to the Associated Press. Jackman said the average salary for laborers there is currently between $5 and $8 per day. Yet, he said many of the locals he encountered were some of the happiest people he has ever met. Jackman said the children lit up at the prospect of receiving a soccer ball as a gift, since they would often play soccer with water bottles and rocks. Many of the locals expressed a level of gratitude that is rare here, Jackman said. Jackman said being a paramedic is often a thankless job because medical care in the U.S. is an expectation rather than a luxury. And while providing that care in Highland County and Haiti is rewarding in both places, Haiti is a place where “we get a whole lot more than we give,” he said. Good News Gathering is located on U.S. Route 62 south of Hillsboro. It can be found online at goodnewsgathering.org.